We're lucky in the UK to be offered an opportunity for free dental care during pregnancy and for the first year after birth - this is offered because during pregnancy, your body is more susceptible to gum disease. It's important to get to know the symptoms and grab yourself a check up during this time. I'm unlucky with my teeth - it's all down to genetics but basically I still have some baby teeth!!!! And some pretty major gaps! This is because I'm missing a fair few adult teeth, mine just never developed - it's got nothing to do with oral hygiene but I know that's an assumption people often make when they see my gaps! I'd get my teeth fixed but the last quote was for a whopping £23k (yep! You read that right!) and much of the dental work would need repeating after about 15 years - Ohhh and its incredibly painful! Some cultures believe a massive great big gap at the front is lucky! Because of the appearance of my teeth, I take mouth health seriously and I'm happy to be a part of this campaign because I think we should all be aware of our gum health! 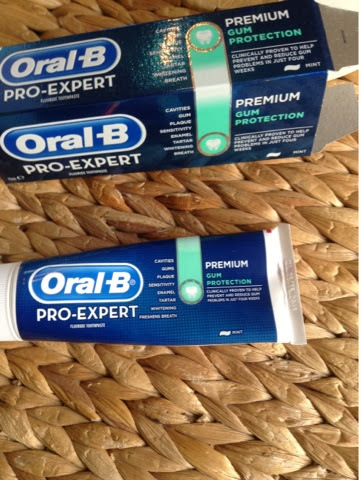 The new Oral B pro expert premium gum protection toothpaste has been clinically proven to help prevent and reduce gum problems in 4 weeks, it helps to slow bacterial growth, reduces plaque and fights tartar. I really like this toothpaste, it's got a hint of a mild almost medicated taste alongside the mint. Wow, Reeling at the price of your treatment. Glad you liked the toothpaste. Commenting for myself and on behalf of BritMums and thanking you for taking part. Your quote £23K! EEkk !!! You could by a flat! Interesting post! How do you still have baby teeth? I never knew they could stay.